Work Sharp WS3000 – The best Wood Tool Sharpener? 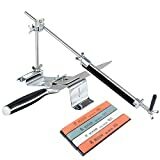 Although we here at Sharpen-up generally prioritize our reviews of kitchen and hunting knife sharpeners, there is room for the odd review covering tools outside of this category. 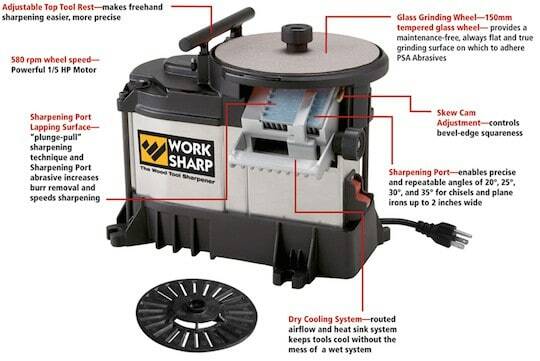 And what better way to do that than looking at the Work Sharp WS3000 wood tool sharpener. The Work Sharp WS3000 is considered by many to be the best wood tool sharpener on the market, with the tool offering high quality, great performance and functionality. The Work Sharp was designed for the serious woodworker in mind, and the features are packed in accordingly. So what exactly are we talking about here? For a start the sharpener allows for a consistent 20°, 25°, 30°, and 35° angle on whatever tool you are sharpening. Furthermore, the sharpening channel can handle blades from 1/8″ up to 2″ in width. The Work Sharp WS3000 also allows for the quick and easy re-hone of tools with a consistent 5° micro-bevel. The operation of the Work Sharp is really easy to get to grips with. When you remove the blade from the sharpening channel, a ceramic abrasive automatically removes the bur from the blade. What you are left with is a razor sharp edge on all your wood cutting tools and a high performance smooth finish. The sharpener’s versatility doesn’t stop there either. If you have tools in your collection that are larger than 2”, the Work Sharp has an optional wide blade attachment that can be purchased separately. The sharpening adapter allows for blades up to 3” in width. One of the reasons the WS3000 is so popular with carpenters and other professionals that use the sharpener is down to its ability to sharpen curved edges. The tool has a feature that Work Sharp calls the Edge-Vision wheel. This enables you to clearly see where the edge off the blade is making contact with the sharpener, thus allowing for a consistent edge all along the blade of the tool. The feature is excellent for both curved and ‘v’ shaped blades. The Work Sharp is as would expect one durable piece of kit. Instead of utilizing standard grinding wheels, the manufacturers have gone one better and have utilized tempered glass, on which you attach adhesive backed abrasive pads. This efficient system means that once the pads have worn you can change them with ease. It also means that the wheels stay true, and do not wear down in heavily used areas. Each wheel can accept two abrasive pads and the Work Sharp comes delivered with 2 wheels. This ultimately means you have 4 grits available at all times. 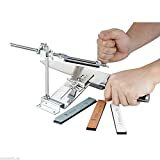 Another feature that has professional wood tool uses declaring the Work Sharp to one of the best wood tool sharpeners around is that fact it a dry sharpening system. Doing away with messy oils, the machine has an innovative system of using airflow from a 1/5 horsepower motor. This airflow removes material from the wheel during the sharpening process. The WS3000 also incorporates an integrated heat sink removing any danger of your blades over heating. If you are in the need of a professional wood tool sharpener then you should look no further. The WS3000 really is one of the best wood tool sharpeners around.